VENTURA, CA - The Bonaventure, an independent senior retirement community located at 10949 Telegraph Road in Ventura, welcomes area seniors to its free “Celebrate Your Independence” events from June 29 through July 1. June 29 at 10 a.m.: A comprehensive educational presentation on the VA Aid and Attendance benefits program. Veterans and surviving spouses may be eligible to receive up to $2,019 per month. The presentation will cover benefit requirements and needed documentation. June 30 at 10 a.m.: A putting contest. July 1 at 11 a.m.: A coffee social. Guests are asked to RSVP by calling The Bonaventure at 805-671-9700. Based in Lake Oswego, Ore., Holiday Retirement founded the concept of independent senior retirement living in 1971 and is the largest provider in North America today with more than 300 communities throughout the U.S. and Canada. Holiday Retirement is in the business of providing security, comfort, and value to independent seniors seeking a fulfilling lifestyle in a welcoming environment. For more information about Holiday Retirement, please call 805-671-9700 or visit www.thebonaventure.net. SACRAMENTO, CA – Veterans returning to the civilian workforce may be eligible for some specialized assistance through the California Department of Consumer Affairs’ Bureau of Security and Investigative Services (Bureau). The Bureau has developed the Veterans Come First program for veterans who want to leverage their military training to become licensed as security guards, private patrol operators, firearms instructors, or other licensee of the Bureau. Veterans will receive priority services including priority in the licensure process, direct line telephone numbers and email contact information, and email or phone notification as soon as their licenses are approved. They will also be assigned their own personal Bureau staff person to support them through the licensing process. The Bureau has posted helpful information about its Veterans Come First program on its Web site. Veterans can obtain additional information about transitioning into the civilian workforce from the California Department of Veterans Affairs and from the state’s Employment Development Department. U.S.VETS’ 2nd Annual Female Veteran Stand Down will bring together over 95 service providers to offer free medical, mental health, dental, nutrition, housing services, employment workshops, legal services, financial counseling, and daycare to female veterans. Please find the flyer attached and the Public Service Announcement link below. Please share within your network and post the flyer where female veterans will be able to readily view the information. Please contact La Trice McBride with any questions @ lmcbride@usvetsinc.org or you can simply reply to this email and I will ensure your requests and questions are answered. Our link is also included in the email below for you to gather all information pertaining to our event. Thank you for your support of our Female Veterans and our Stand Down! It is an honor to be a part of such a wonderful network of individuals! Thank you! SACRAMENTO, CA – Yesterday, June 5, 2012, Governor Edmund G. Brown Jr. appointed Raymond Lau as Administrator of the Veterans Home of California, Barstow. Lau, of Banning, was administrator at Century Skilled Nursing Care from 2009 to 2012 and served as administrator at Plymouth Tower from 2006 to 2009. He was administrator at Beverly Manor of Bakersfield from 2005 to 2006 and administrator at Golden Cross Healthcare of Fresno in 2005. Lau was executive director at Country Villa Redlands Healthcare from 2002 to 2004. He was a real estate agent for Pat Rutherford and Associates from 1979 to 2002. We at CalVet can find no better way to express the true meaning of Memorial Day than by quoting the words Abraham Lincoln wrote in a letter to Mrs. Lydia Bixby, a widow living in Boston to express his condolences for the death of her sons. The California Department of Veterans Affairs (CalVet) has just released its updated 2012 Enterprise Strategic Plan, which focuses on fiscal and operational efficiency, innovation, and encourages working with key stakeholders and partners in the public and private sectors. This forward-thinking strategic plan aims to pave the way for CalVet to continue delivering modern 21st Century, accessible and superior services to California veterans. “CalVet’s strategic plan for 2012 is a collaborative effort that reflects Governor Brown's great respect and appreciation for our veterans and the sacrifices they have made, and is in keeping with his vision for California's future,” stated CalVet Secretary Peter J. Gravett, Major General (Ret). In developing this plan we focused on one question: How will the California Department of Veterans Affairs deliver services in innovative ways that meet and exceed the expectations of California's veterans and their families? We improved our planning processes with a more deliberative analysis of how veterans perceive their needs and how this department could best meet those needs. We sought input from community partners and associates in the Veteran Services Organizations and County Veterans Service Offices. The CalVet Memorial Day 2012 Events Calendar is now online at www.calvet.ca.gov. This calendar will be updated periodically until Friday, May 25. Please continue to submit your events to Jaime.Arteaga@calvet.ca.gov. Please include Name of event, Sponsor, Time, Contact name, Email, Telephone number, and Location. MILLER: Injured vet’s guns stolen by D.C.
After being injured on his second tour of duty in Afghanistan, Lt. Augustine Kim spent the night in a D.C. jail for possessing unregistered guns. Mr. Kim was transporting his firearms from his parents’ house in New Jersey to South Carolina when he stopped at Walter Reed in Washington for a medical appointment in the summer of 2010. After being pulled over, handcuffed, arrested, thrown in jail overnight, his guns were confiscated by the city. In the end, the platoon leader felt forced to plead guilty to a misdemeanor charge, which was later dismissed, but the District still refuses to return to him $10,000 worth of firearms and parts. The national guardsman will deploy to Kosovo this summer. The city should return his property before he leaves to serve our nation overseas for the third time. Naval Base Ventura County, Point Mugu, CA - Naval Base Ventura County has captured the Chief of Naval Operations (CNO) Award for Safety Ashore for a large, non-industrial installation for fiscal year 2011. Every year, Navy installations around the world submit packets for awards consideration. Competition can be fierce, with only one installation in each category able to take home top honors. This year, NBVC grabbed the prize. The winner in each category is recognized for strong outstanding support and achievement in safety and occupational health and for directly supporting the Secretary of Defense’s 75 percent mishap reduction goal. Strong leadership and innovative marketing of safety training are also key to snagging the award. Strong community partnerships, award-winner motorcycle safety initiatives and concerted communication efforts also contributed to the NBVC Safety receiving the CNO’s Safety Ashore Award for fiscal year 2011. “It’s really about the team working together to make this a safe place to work,” said NBVC’s Installation Safety Director George Egeler. For more information, contact the Naval Base Ventura County Public Affairs Officer at 805-989-9234. Veterans considering assisted living are encouraged to apply to any of the beautiful Veterans Homes of California. Spouses are also eligible to apply with the veteran. Veterans Homes of California are also located in Chula Vista, Ventura and Yountville. Veterans Homes are currently under construction in Redding and Fresno. For additional information, log on to the CalVet website at www.calvet.ca.gov. 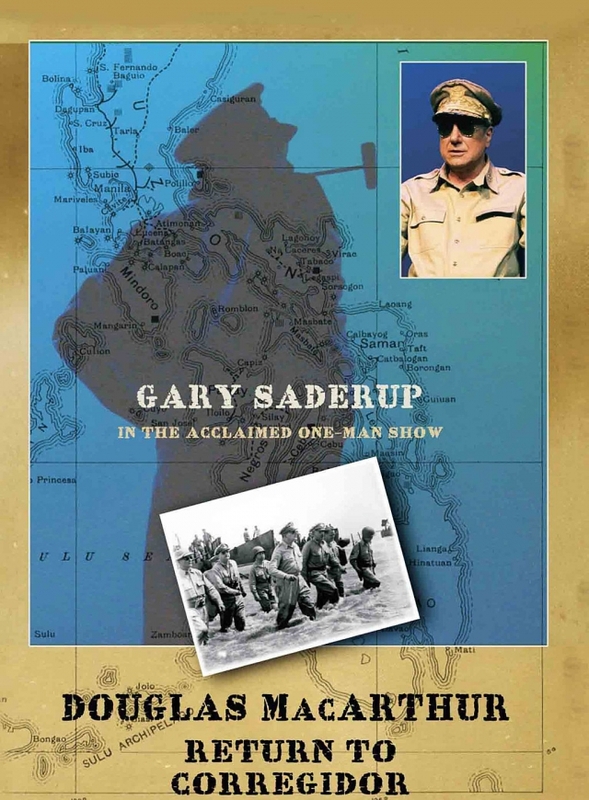 THOUSAND OAKS, CA - California Lutheran University will screen a film featuring Santa Rosa Valley resident Gary Saderup’s one-man show about Gen. Douglas MacArthur. “Douglas MacArthur: Return to Corregidor” will be shown at 7 p.m. Thursday, April 19, in Preus-Brandt Forum. The 63-minute film will be followed by a discussion with Saderup, a veteran actor and artist, and CLU assistant professor of history David Nelson. In his show, Saderup creates a sensitive portrait of the legendary and larger-than-life American general. In a character study similar to Hal Holbrook’s one-man show portraying Mark Twain, Saderup brings to life the soul and essence of the general. The 2011 film offers an in-depth look at this opinionated, bold, controversial and stubborn leader. During World War II, when Japanese forces tightened their grip on the Philippines, President FranklinRoosevelt ordered MacArthur to relocate to Australia. MacArthur left reluctantly but vowed to return for his troops – a promise he fulfilled after more than two years of fighting in the Pacific. MacArthur was awarded the Medal of Honor for his leadership in the defense of the Philippines. Saderup has appeared on stage as Shakespeare’s Macbeth, Othello and Richard III. He played John Barrymore in “I Hate Hamlet” and more recently appeared as Charles Darwin with actor Patrick Warburton in the hitBritish play “Darwin in Malibu.” He is also an accomplished artist who is well known for his charcoal portraits of Hollywood legends such as John Wayne, Marilyn Monroe and Clint Eastwood. Nelson holds a doctorate in pre-modern Asian history from Indiana University Bloomington. His specialties are medieval and early modern Japanese cultural and institutional history, and his research interests include the cultural history of 20th-century Japanese imperialism. The forum is located south of Olsen Road between Mountclef Boulevard and Campus Drive. The History Department and History Club are sponsoring the free event. For moreinformation, contact the University Relations office at 805-493-3151. Welcome to Leo Brunker's website. Thank you for your time and please read his story. I just want to try to help my friend. Leo Brunker is an Adapted Physical Education teacher who works in the Los Angeles Unified School District. He is a family man who has a wife, a son in middle school and a daughter in elementary school. Leo also is a Desert Storm War Veteran which liberated Kuwait. It has been 20 plus years later and Leo's body is failing him physically. The VA hospital and Kaiser have no explanations of why his body is failing. I woke up one morning and felt compelled to do something. So, I am collecting donations to help Leo and his family as well as asking for prayer and to put out awareness for Desert Storm Veterans. On October 16th, 1990, prior to deployment Leo passed a health exam that qualified him for Special Forces and maxed out his last P.T. test (physical training test running 2 miles in 11 minutes 54 seconds, and doing 96 plus sit-ups and push-ups in 2 minutes or less each) confirming he was in good health before his deployment. While serving in Desert Shield/Desert Storm he served in Alpha 6/52 A.D.A. in the 7th Corps. Leo first noticed something wrong even before they went into action. He and a number of other soldiers fell ill instantly with extreme flu like symptoms after they received their pre-deployment shots that were given to them before the War. Then came the Desert Storm Campaign. His unit was stationed on the border of Kuwait and Iraq. His job was to provide air support to his unit. He did this by riding in a hum-vee and manning a stinger missile. His job was to give air support and shoot down any enemy jet fighters or helicopters that would put his unit, and the tank units in danger. The tank units they supported faced the Republican Guard, (Iraq's special elite fighting force,) which they defeated quickly and forcefully. On a regular basis the ground would rumble all night as the Air Force was striking their targets with precision. The ground campaign was equally effective. During the actual fighting, chemical alarms were sounding off daily. One night they were ordered to sleep in their full body chemical warfare gear. Contrary to what the media and our government have said: There were exposure to multiple neuro-toxins such as chemical weapons, oil well fires, depleted uranium, and the list goes on. There are veterans to this day suffering from the effects like my friend Leo (VA's estimation is 250,000 suffering from Gulf War Illness). Leo has conformation from the DoD (Department of Defense) of his unit being exposed to the Khamisiyha weapons depot. Please look at this website http://www.a40deepstrike.com/victory-3.html and press the play button on the lower right hand side. Leo has signs and symptoms of both undiagnosed illness and medically unexplained chronic multi-symptom illnesses including: 1)diagnosed with chronic fatigue syndrome, 2) signs or symptoms involving the skin, 3)headaches, 4)muscle pain, 5)joint pain, 6) neurological signs or symptoms (diagnosed with idiopathic neuropathy and a chronic pain disorder),(Leo's every waking moment he feels burning on the entire left side of his body and much of his right side,) 7) neuropsychological signs or symptoms, 8) Upper respiratory and lower respiratory problems,(Leo has been diagnosed with asthma and chronic bronchitis,) 9) Sleep disturbances ( diagnosed with both obstructive and central sleep apnea, (Leo can only sleep 3-4 hours at a time due to the pain,) 9)gastrointestinal signs or symptoms, (Leo has been diagnosed with diverticulitis,) 10) abnormal weight loss or gain, (Leo has lost 20 pounds this past year.) In addition, he has chemical sensitivity issues/MCS. When he smells colognes, perfumes, detergents, second hand smoke from cigarettes, cleaners and many other every day products his nose, throat ,and mouth have a burning sensation along with severe headaches and breathing issues are triggered. He has numerous growths throughout his body. He has been to the ER room six times in the past three years due to unknown reason and experiencing seizure-like symptoms of shaking uncontrollably and not being able to talk. (I was with him on one occasion and could not believe the pain and uncontrollable shaking he was experiencing. )He has cysts growing on his kidneys and kidney stones. To top it off, his body is having adverse affects with any pain medications and muscle relaxers, so controlling the pain has not been possible to date. Leo has been hit hard financially. He cannot work full time and his sick days ran out in February 2012. He has filed for disability retirement claim with Cal Strs (California State Teachers Retirement System) where he is representing himself at this time and continues to wait for a decision on this. Leo is also 70% service connected disabled through the VA and his case is currently in appeals due to the fact that the VA did not adjudicate his case as the law states. I want to help my good friend, so if you feel led please help Leo and his family and please pray for Leo and his family. WASHINGTON, D.C. – Congressman Mike Thompson (CA-1) today announced that the Yountville Veterans Home Post Office will remain open despite having been considered last year for closure by the United States Postal Service (USPS). Last July, the post office was included on a list of approximately 3,700 others being considered for closure by the USPS. Thompson, who represents the Yountville veterans home, led the effort against its closure. "After a long and careful review, I determined that the customer service options that would be left for our veterans and staff would not be sufficient to meet their needs or our obligation to serve them," said USPS Bay-Valley District Manager Kim Fernandez. The Yountville Veterans Home is one of the oldest in the nation and currently houses over 1,000 veterans, representing every era of warrior from World War II to the present conflicts. The residents range from those who are in the final stages of their lives to those who are trying to adjust from Traumatic Brain Injury and Post Traumatic Stress Disorder from Iraq and Afghanistan. The Yountville Veterans Home Post Office was the only post office on the USPS’s potential closure list that is located in a veterans home. The USPS estimated that the closure of the Yountville Veterans Home post office would only save approximately $1,000 per year. In August 2011 Thompson wrote to Postmaster General Patrick Donahoe urging that he reconsider closing the post office. Thompson also worked with local town and county officials, the American Legion and the California Department of Veterans Affairs to oppose the closing of the veterans home post office. Visit our Facebook page at www.Facebook.com/mycalvet and follow us on twitter/mycalvet. A simple check mark on your state income tax form this year can help veterans living in one of our California Veterans Homes live a more fulfilling life by providing recreational materials like movie and books and social events like trips to ballgames and concerts. “Donating to this worthwhile fund is an excellent way for the Veterans Homes of California to increase their Morale, Welfare and Recreation (MWR) Fund to help improve the quality of life for our deserving veteran residents,” said Major General (Ret.) Peter J. Gravett, Secretary of the California Department of Veterans Affairs. “Please help promote this effort to individuals you may know who are looking for a way to help support veterans and the Veterans Homes of California. It is an easy way to give back to those who have given so much to our country. On behalf of our wonderful veterans, I thank you. Veterans Home advocates are asking veterans supporters in California to please consider donating to the California Veterans Home Fund when filing their 2011 California Income Tax Returns before April 17, 2012. The Fund is Code #417 on Line #110 of the California Form 540 for the 2011 tax year. The total received by the State is divided and distributed among each of the six Veterans Homes of California. These beautiful homes were built as an expression of gratitude toward California’s veterans, and are located in Yountville (the oldest and largest State Veterans Home in the nation), Chula Vista, Barstow, Ventura, Lancaster, and the newest home in West Los Angeles, built adjacent to the USDVA Hospital. Two additional Veterans Homes are currently under construction in Fresno and Redding. In 2010, Assembly Bill 1088 (Fletcher) established the “California Veterans Home Fund,” allowing taxpayers to donate directly to this fund from their State Income Tax refunds. To date, from January 2011 through November, 2011, nearly 19,000 California taxpayers have donated $210,720 from their State Income Tax refunds to this new fund to help the residents at the California Veterans Homes. For more information on this effort, as well as Veterans benefits, employment, educational resources, services, Veterans Homes of California, CalVet Home Loans, Veterans license plates, and much more, please log on to the CalVet website at www.calvet.ca.gov. If you served in the military, plan to attend a Free Veteran’s Information Seminar on Saturday, April 14th, 2012 @ 10:00 a.m. Hear about specific benefits and services from the U.S. Department of Veterans Affairs (VA), California Department of Veterans Affairs, the Department of Defense and local government agencies. The event will be held at Oxnard Family Circle’s new location: 2100 Outlet Center Drive, # 380, Oxnard, CA. Veterans from all eras are encouraged to attend. For more information call Oxnard Family Circle @ 805-385-4180. Ventura, CA - If you served in the military, then you deserve to know the many benefits available to you. Plan to attend a FREE Veteran’s Information Seminar, hosted by Oxnard Family Circle, Livingston Memorial VNA and the Disabled American Veterans (DAV). There will be informational booths, a panel of Veteran experts, and a DAV presentation. Come hear about specific benefits and services from the U.S. Department of Veterans Affairs (VA), California Department of Veterans Affairs, the Department of Defense and local government agencies. You will hear from the experts and receive the best counseling and claim filing assistance for Veterans and their families. 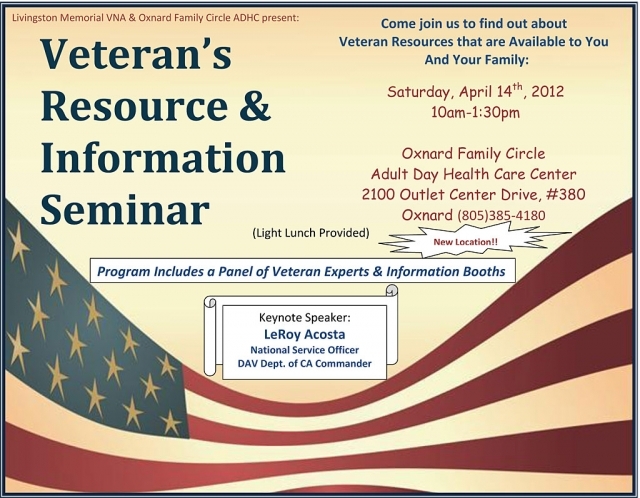 The event will occur on: Saturday, April 14th, 2012 @ 10:00 a.m. and will be held at Oxnard Family Circle’s new location: 2100 Outlet Center Drive, # 380, Oxnard, CA. Veterans from all eras, widowed spouses and families are encouraged to attend. For more information call Oxnard Family Circle @ 805-385-4180. LOS ANGELES, CA – The Coast Guard is assisting local law enforcement in the recovery of a missing body near Santa Cruz Island, March 12, 2012. The Santa Barbara County Sheriff’s Department Dive Unit is on scene leading the effort for recovering the missing boater. The Coast Guard Cutter Halibut is also on scene assisting the dive unit in their efforts. The search began yesterday when a family member of a missing individual contacted the Channel Islands Harbor Patrol. The boaters reportedly left for a fishing trip at 10 a.m. and were due to return at 8 p.m., March 10, 2012. CIHP contacted Coast Guard Sector Los Angeles-Long Beach, who initiated a search and rescue case. A Coast Guard search and rescue helicopter located three bodies near the shoreline of Santa Cruz Island at 12 p.m., yesterday. Involved in the search was a 47-foot motor lifeboat from Station Channel Islands Harbor, the Coast Guard Cutter Halibut, a MH-65 Dolphin helicopter from Air Station Los Angeles to search for the men. A Santa Barbara County Sheriff Department helicopter and the Santa Cruz Island Park Rangers also assisted in the search efforts. When retired Air Force pilot Mike Ross learned this month that the Navy aviator who shot him down is on a nomination list for the rank of admiral, he had a visceral reaction. All the horror and pain came rushing back when he read The Washington Times story about NavyCapt. Timothy W. Dorsey’s pending promotion to flag rank. The Pentagon sent his nomination to the Senate Armed Services Committee this month. This tale of two officers began nearly 25 years ago. Col. Ross, an Air Force captain at the time, was flying his RF-4C reconnaissance jet over the Mediterranean Sea in a NATO non-fire exercise. He refueled with an Air National Guard aerial tanker and saw Lt. (j.g.) Dorsey’s F-14 Tomcat monitoring him.